Arrival Da Nangairpot by VN…/….Meeting with guide and bus at the aiport. Visit Da Nang: Cham Scultupre Museum. Ngu Hanh Marble mountain. Transfer to Hoi An. Chacking in hotel in Hoi An. Lunch. Visit the ancient town: The Japannese bridge Pagoda, A Fook Kien Temple, Duong Lam ancient house. Visit & sea bathing at Cua Dai beach. Dinner at local restaurant. Night in hotel. Breakfast. Drive to Hue via Da Nang. Visit on the way Hai Van Col, Lang Co beach. Arrival Hue. Checking in hotel. Lunch. 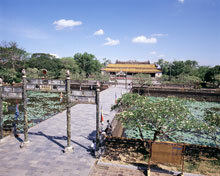 Visit Khai Dinh & Tu Duc emperors’ tombs. Dinner at local restaurant. Night in hotel. Breakfast. 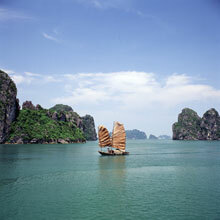 Boatcruise on Perfume river to visit Linh Mu Pagoda, Minh Mang emperor’s tomb. Back to Hue. Lunch at local restaurant. Visit sit The Ancient citadel with Rayal Palaces, Dong Ba Market. Dinner. Night in hotel. Breakfast. Transfer to Phu Bai airpot. Flight to Ha Noi by VN. Arrival Noi Bai airport. Meeting with guide and bus. Transfer to Ha Long. Boatcruise in Ha Long Bay. Seafood lunch on board. Visit Thien Cung & Dau Go caves. Checking in hotel in Ha Long. Dinner. Night in hotel. Breakfast. Back to Ha Noi. Stop on the way for visiting and shopping. Cheking in hotel in Ha Noi lunch. Visit Ha Noi: The Museum of history, Hoan Kiem Lake, Ngoc Son Temple. Dinner at local restaurant. Water puppet show. Night in hotel. Breakfast. Visit: Ho Chi Minh Mausoleum, The former President’s residence, One Pillar Pagoda, The Ancient citadel, Quan Thanh Temple. Lunch at local restaurant The Literature temple, The ethnique Museum. Shopping. Dinner. Night in hotel. Breakfast. Free for shopping. Lunch. Transfer to airport. Flight back home bay VN…End of services.